The Moon (or ‘Luna’ in Latin) has occupied a prominent place in myth and folklore throughout human history. 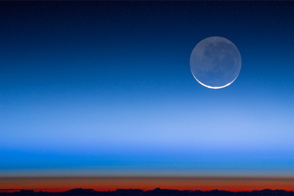 In the higher latitudes of the northern hemisphere, the day-to-day change in the time of moonrise is smallest in the months surrounding the fall equinox. This consistency is due to the small angle between the horizon and the ecliptic (the apparent sky path traveled by both the Moon and the Sun) at this time of year. The bright, full disk of Luna provides enough dependable light in the evening to allow longer days for harvesting crops—which has led to the “Harvest Moon” of numerous songs, stories, paintings and photographs. The Moon also inspired the most ambitious human endeavor to date—landing astronauts on its surface to examine our closest celestial neighbor directly. If you were alive and aware on July 20, 1969, you were probably glued to a television set somewhere on the planet—at home with your family, gazing avidly through a storefront window, or gathered with friends at a community center or vacation cottage. On that day, America and much of the world watched, awestruck, as astronauts landed on the Moon and shared with us a look back at Earth. 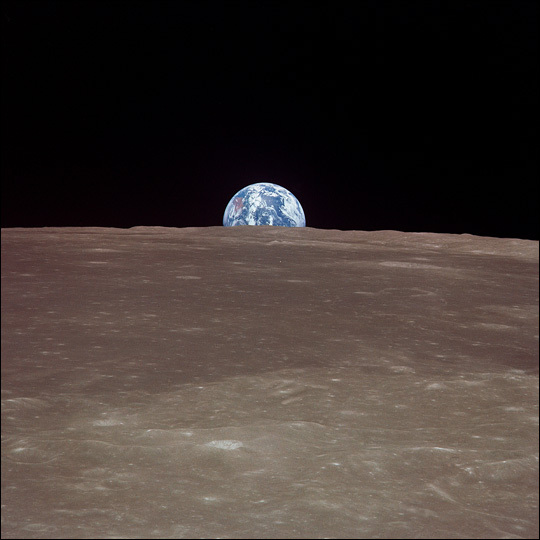 While the Harvest Moon has allowed humans throughout history to coax “just a little more” from the Earth’s bounty before the onset of winter, images of our home from the moon helped raise awareness of the Earth as a rare (and perhaps unique) ‘planetary ecosystem.’ The Apollo 11 images provided a global backdrop for the building U.S. environmental movement, including a surge of citizen-led environmental cleanups in the 1960s and 70s, and implementation of key national environmental policies. Astronaut photograph AS11-44-6548 was acquired in July of 1969 with a Hasselblad film camera. The image is provided by the Earth Observations and Image Analysis Laboratory, Johnson Space Center. The International Space Station Program supports the laboratory to help astronauts take pictures of Earth that will be of the greatest value to scientists and the public, and to make those images freely available on the Internet. Additional images taken by astronauts and cosmonauts can be viewed at the NASA/JSC Gateway to Astronaut Photography of Earth.